First lets take a good look at the speaker above. Click each thumbnail image to show a larger image of the speaker. Now lets super size it. Click the larger image to bring up an even larger, cleaner picture. Now that you can see what you are looking at, lets talk about it. 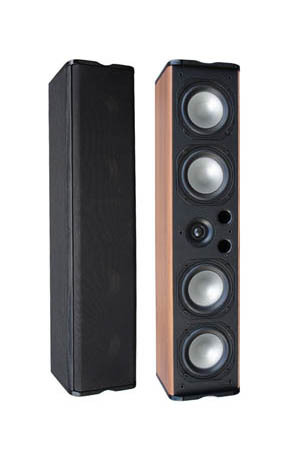 These speakers are designed to bring out a wide range of sounds whether they are being used for a DVD experience or just plain old rock and roll. We have incorporated four 4" polygraphite woofers to deliver subtle but pounding bass. The tweeter is the clearest tweeter available for home speakers. Thrilling highs can be produced as high up as the human ear can hear. Perfect To match up with an on wall Plasma or LCD display. Wall brackets are included. It is available in two stunning colors black or cherry. Both the top and bottom of the cabinet are also custom finished in a high gloss piano black lacquer. Not only does this speaker sound the best in its class, it will bring style to any room in your home.